Gremlins out there are determined to keep your work from being published, your book from being promoted. They are resolved to embarrass you before the gatekeepers who can turn the key of success for you. 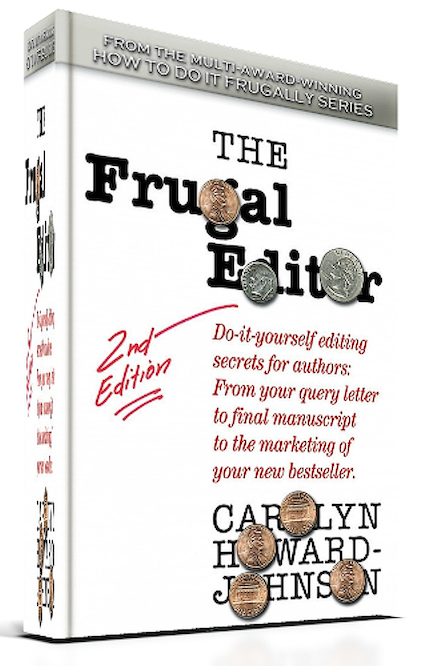 Whether you are a new or experienced author, you need the multi award-winning "The Frugal Editor." It won USA Book News Award, Reader Views Literary Award, and was a finalist in the New Generations Award. I have a special treat today for subscribers and visitors to The Frugal, Smart, and Tuned-In Editor blog! I asked Carolyn Wilhelm (see more about her in the the little bio I added at the end of this blog), to expand on one of her Facebook posts about group words for different species of birds. I found it fascinating and noticed there were enough Facebook shares to convince me I was not alone. Knowing how I am about editing, my "other Carolyn" wrapped some of those group words (you know the words that describe groups but are treated as singular like "a pride of lions") into a kind of review of my editing book. I bet she has some group words you've never heard and some ideas for editing gleaned from my book that will inspire you to do one more edit before you submit your manuscript to a publisher or an agent. Is it almost time to turn in a manuscript? Need some down to earth advice? Self-editing can be a daunting task as it is very difficult to see your own work with fresh eyes. You might not notice a mistake through several re-reads. When you finally notice you think, "How did I miss that? I've read this a hundred times. And how did my proofreaders miss it?" Because the more familiar our brains are with the content in print, the less we are able to focus on details. If you and your proofreaders know the about the story you are writing, you may not be enlisting enough help for publication. Word will not offer enough support. Grammarly and other programs alone won't find every error. The publisher will notice, though, and there are several important things to know. Here are some creative ideas for adding flair to your writing piece when editing. 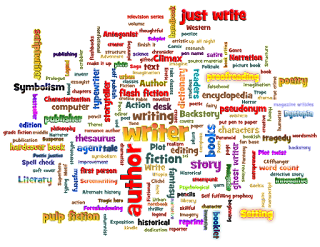 Carolyn Howard-Johnson says that many writers who are not poets occasionally find alliteration, assonance, and rhyme useful tools for leads, headlines, titles, and copywriting. 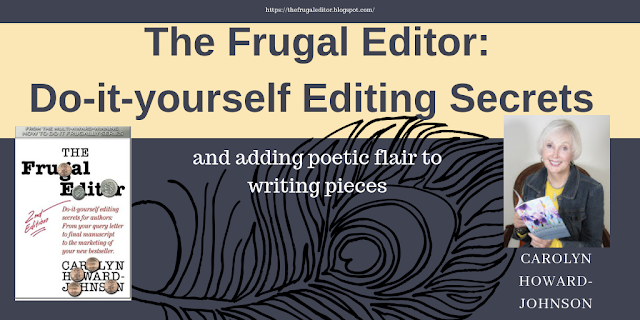 She has more specific information about how to use poetic language in manuscripts in her The Frugal Editor. 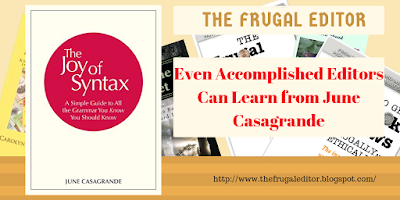 Scroll down for more information on that book from her HowToDoItFrugally Series of books for writers. Recently, I was reading about collective nouns for birds. The earliest use of collective nouns stems from the Book of St. Albans, published in 1486. 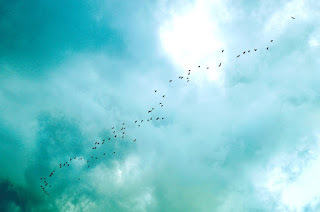 As a teacher, I found children loved the terms like "gaggle of geese." Supposedly such terms were supposed to be poetic as well as scientific in describing the birds. Two for one. Here is link to that resource. And here is an example. "...an exaltation of larks is a poetic comment on the climb of the skylark high into the sky while uttering its twittering song." We could say larks and that could be that, but how nice to say there was an exaltation of larks. Or we could adapt the word "exaltation" to describe the way they behave in a group. Where else could some poetic language replace plain language? Yes, we want to tell our stories, but it's good to give our readers the ability to form images in their minds. We can keep that in mind as we edit. My writing group enjoys passing out little items to help us when we are back at home and writing. I have a bookmark with figurative language definitions. Of course, we know that when we are writing that first draft (ignoring mistakes as we work, very tough for many people) we might not include such language. When we go back, we might wonder how to improve a sentence, but might forget to add similes or metaphor to help create more relatable imagery. Howard-Johnson has suggestions in this area, also. She shares a tip on how using our search for adverbs can yield metaphors or similes, the kinds of associations that allow you to find and insert flecks of solid gold into your copy. Who knew? When I taught elementary school classes, I would tell the children to check with their ten fingers as they proofread. While reading, they put down a finger on the left hand if one of the five senses was included (sight, smell, sound, taste, or texture). OK, for the right hand, they checked for capital letters, punctuation, spelling, paragraph breaks, and neatness. A similar approach might be used by anyone to help check for what you need to add to strengthen your own writing. Make your own strategy for editing your own areas that need strengthening. You know yourself best. Howard-Johnson says and guidelines for print and the Web are galaxies apart. She says to think of them as different genres. Be prepared to provide copy for print as well as possible requests from your publisher or own self-publishing efforts to ensure the best version to meet different guidelines. Be ready so you don't have to scramble later. She says this is especially true for rules surrounding dashes, hyphens, em dashes, and en dashes. If you don't know what these are, it is time to learn. The explanations are in her book. The Web is not the place to try to learn this information since it is different from print requirements. She provides many helpful examples. One of my writing friends uses no adverbs at all in her books. That is certainly one way around this problematic area. Mainly, writing pieces need to be checked for overused words. If you have favorites, first make a list of the words and find possible substitutions before you even edit. Use Control-A on your computer's keyboard to select all. Use that function to search for the words you you know you overuse. Ask friends to read and notice repeated words. Then as you encounter such words, you will have a ready list of substitutions. This requires thinking, considering, creativity. You won't want to auto replace, of course. Carolyn Howard-Johnson states: "Ask your publisher who is responsible for making the index. Today, nonfiction authors are often asked to put them together even when their books are published traditionally. Anything that will help your reader is worth the time and effort. 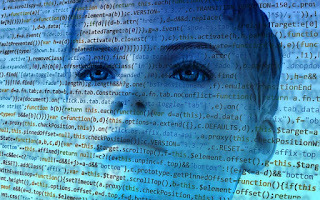 If you decide to build your own index, expect to spend time reading up on how to do it right; do not rely entirely on the index function of your word processor." That is so clearly stated her own words are best. Now here's a thought. As you make the index, better word choices might occur to you, so it is actually a help in self-editing. What would you like in your index? Maybe you would like some sparkly and interesting words? This is another time to consider word choice. Carolyn Wilhelm is the author of several books for children including Alex Asks About Auntie's Airplane Day, an adoption day story, and an educator who runs Wise Owl Factory that offers teaching aids--including many that are free--on Pinterest ( https://www.pinterest.com/wiseowlfactory/) and some that cover editing-related topics like writing and grammar. Carolyn Howard-Johnson is the author of fiction, creative nonfiction, and poetry. She is also a marketing consultant, editor, and author of the multi award-winning HowToDoItFrugally Series of books for writers including the award-winning second editions of The Frugal Book Promoter and The Frugal Editor. 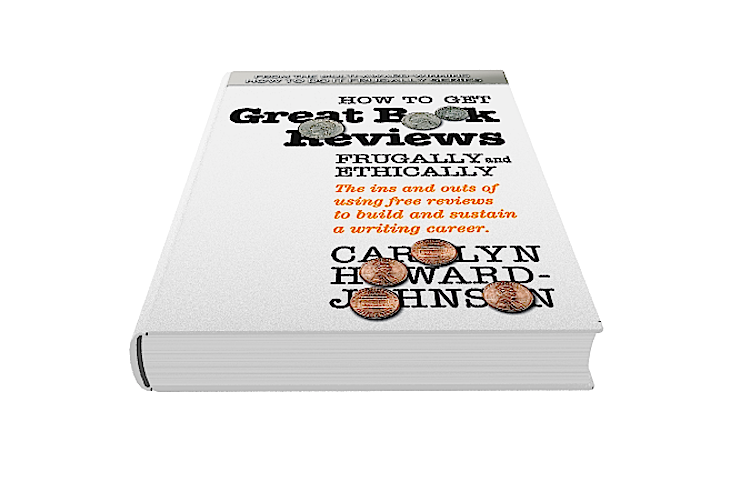 Her latest is in the series is How to Get Great Book Reviews Frugally and Ethically. Learn more on her Amazon profile page, http://bit.ly/CarolynsAmznProfile. Great Little Last Minute Editing Tips for Writers is one of her booklets--perfect for inexpensive gift giving--and The Great First Impression Book Proposal, another booklet, helps writers who want to be traditionally published. She has three FRUGAL books for retailers including one she encourages authors to read because it will help them convince retailers to host their workshops, presentations, and signings. It is A Retailer’s Guide to Frugal In-Store Promotions: How To Increase Profits and Spit in the Eyes of Economic Downturns with Thrifty Events and Sales Techniques. She helps writers extend the exposure of their favorite reviews at TheNewBookReview.blogspot.com. She also blogs at all things editing--grammar, formatting and more--at The Frugal, Smart,and Tuned-In Editor (http://TheFrugalEditor.blogspot.com). Her SharingwithWriters.blogspot.com blog focuses on the writing life and book marketing and promotion. It is a Writers' Digest 101 Best blogs pick. I know it has been a long time since subscribers of The Frugal, Smart, and Tuned-In Editor Blog have heard from me! Even though I am a bit out of commission doing a caretaking stint for my daughter who broke her foot, I couldn’t resist passing this story about French efforts to keep their language “pure” when I saw it in PEN America‘s newsletter. This used to be a topic that came up often, but I haven’t seen it lately. It always amazes me when I see it so I am indeed amazed anew! French itself is based on changes made in Latin over years—along with several other Romance languages. Similarly, English is filled with Latin words and French words borrowed after 1066 when England had French royalty. What would we do without "chandelier?" So different from "light fixture." So are the French fighting a losing battle? Doesn’t this kind of thing obfuscate principles of linguistics and encourage the kind of bigotry that is causing so much trouble in the world now? What do you think? You'll find a link below to send me your own personal rant! DARE is a project of PEN America's #LouderTogether campaign, bringing you a daily-curated roundup of the most important free expression-related news from the U.S. and abroad. Send your feedback and story suggestions to DARE@pen.org. Subscribe at pen.org. Howard-Johnson is the author of fiction, creative nonfiction, and poetry. She is also a marketing consultant, editor, and author of the multi award-winning HowToDoItFrugally Series of books for writers including the award-winning second editions of The Frugal Book Promoter and The Frugal Editor. Her latest is in the series is How to Get Great Book Reviews Frugally and Ethically. Learn more on her Amazon profile page, http://bit.ly/CarolynsAmznProfile. Great Little Last Minute Editing Tips for Writers is one of her booklets--perfect for inexpensive gift giving--and, another booklet, The Great First Impression Book Proposal helps writers who want to be traditionally published. She has three FRUGAL books for retailers including one she encourages authors to read because it will help them convince retailers to host their workshops, presentations, and signings. It is A Retailer’s Guide to Frugal In-Store Promotions: How To Increase Profits and Spit in the Eyes of Economic Downturns with Thrifty Events and Sales Techniques. In addition to this blog, she helps writers extend the exposure of their favorite reviews at TheNewBookReview.blogspot.com. She also blogs at all things editing--grammar, formatting and more--at The Frugal, Smart, and Tuned-In Editor (http://TheFrugalEditor.blogspot.com )Her SharingwithWriters.blogspot.com blog focuses on the writing life and book marketing and promotion. It is a Writers' Digest 101 Best blogs pick. Those of you who visit this blog or are subscribed to it know that I also blog at The New Book Review where this lovely review might inform (and tease!) you a bit, but because I have long been a fan of June Casagrande's sage editing advice, I wanted to share it with you here, too! The first thing that popped into my head when I first began reading June Casagrande's lively, informative The Joy of Syntax: A Simple Guide to All the Grammar You Know You Should Know was me in the backseat of my parents' car circa 1960, listening to Mom and Dad engage in a heated argument over incorrect vs. correct grammar. I don't recall what "rule" they were debating, only the yelling. That's how seriously a grammar mistake can affect us. 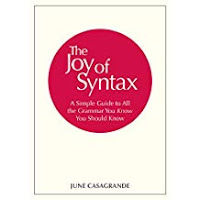 When it comes to syntax, I suspect people may be divided into three categories: those who know what syntax is and care; those who heard about it in English class but it didn't stick; and those who do not care at all. The first group contains people who love words or need them to advance their careers, future careers, and/or social standing. Those are the people who stand to get the most out of this book. Casagrande's style is simple, direct, and friendly-humorous. The book's contents reflect a trove of enlightening trivia such as "Well as an Adverb and an Adjective;" "Dangling Participles and Other Danglers;" "Language Myths" (brace yourself). Part I focuses on "Syntax" and Part II on "Usage and Propriety." The latter goes beyond the average English speaker/writer's grasp of what is grammatically correct and explains that the acceptability of certain words can depend on whether they have been accepted into common usage. 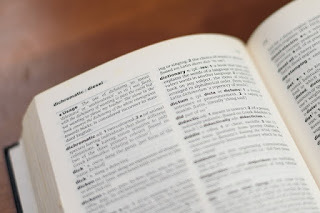 Did you know that if a word is found in the dictionary, it's considered "valid"? Not necessarily appropriate for your dissertation, but not "wrong" in more casual contexts. (1) It is always wrong to say or write "ain't." (2) "Nauseous" and "Nauseated" can be used interchangeably. (3) "Tomorrow" is both a noun and an adverb. (4) Most, if not all, grammar questions can be answered by looking in the dictionary. Here's a hint: number one is false. Surprised? Want to know why? Read the book. As for the rest...read the book. It won't kill you and you might even learn something. Marlan Warren is an L.A. journalist, novelist, playwright, screenwriter, blogger, and publicist with Roadmap Communications and Book Publicity by Marlan. She reviews for the Midwest Book Review and her blogs include “Roadmap Girl’s Book Buzz” and “L.A. Now and Then.” Her press releases are published in Broadway World Book News and the BBC Record. She is the author of the novel, “Roadmaps for the Sexually Challenged: All’s Not Fair in Love or War” and the producer/writer of the acclaimed documentary, “Reunion." Marlan is now in production for the documentary “What Did You Do in the War, Mama? : Kochiyama’s Crusaders” based on her play “Bits of Paradise." No Christmas Cliches: Nixing "reaching out!" But we only have to put up with Christmas clichés once a year. In another article Stewart recommended, the writer used "reached out" to introduce the rant to introduce his essay. Now, that Clive really bothers me because it has begun to lose its original meaning– – Yes, I am old enough to remember when "reach out" became popular. There was a touchy – feely aspect to it. It him ply deed on the part of the reacher, or on the part of the reachee. It imparted the notion of giving and receiving. In the process good old words that have always worked for us got neglected. Words like "interviews" or "asked." 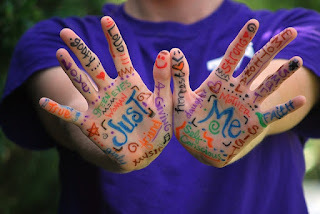 They are old words– – not very fancy or poetic– – but they are basics that need no dressing up to get the point across. Just thought I would share with you my own little cliche rant today. Find this fun article on Christmas cliches that are often inspired Christmas songs where they sounded just fine at: http://m.ragan.com/Main/Articles/10_clichs_to_ditch_this_holiday_season_51955.aspx. It turns out that a few carefully chosen zingers can be “an indicator of intelligence” according a study from Massachusetts College of Liberal Arts and Marist College in New York. So, I don’t think you’ll ever find an unsavory expletive in this newsletter, but you are sure to find idioms and colloquialisms everywhere. I do try not to let even my foulest fictional characters cuss beyond what is needed for their character and the situation. And, yes sometimes I use words with lots of syllables, too, especially when they say things better than the short ones (which is rarely). All this is not to encourage writers to cuss. It is to remind them that if the words they use in dialogue are too. . . mmmm. . .staid, they may render their . . . well, let’s say unnatural? Or stilted? One of your characters may just be the type who must have a potty mouth if she is to seem real to your reader. And sometimes that character won’t be the tough-talking dude cliché. Those who write humor know that tough-talking character may be a fragile woman with gray. . . er. . . platinum hair. marketing consultant, editor, and author of the multi award-winning HowToDoItFrugally Series of books for writers including the award-winningest book in the series, The Frugal Editor. It's my new briefcase-size helper! The Frugal Editor wins Reader Views Literary Award for best in the category of publishing. Carolyn's promotion campaign for The Frugal Editor grabbed down the New Generation Indie's top award for marketing and the book was a finalist in that contest's how-to category. Inviting You To Be Part of My World! ~Carolyn Is an Audio Diva! Learn While You Drive! ~Resources for Readers! Resources for Writers! HowToDoItFrugally.com Is Calling! ~Check Out World-Reknowned UCLA Writers' Program Blog, Then My Classes There! You are at the home of The Frugal Editor. This blog is intended to be a place where writers of all kinds can ask questions about how they can improve their writing. That includes the writing of business letters, query letters, poetry, book manscripts, book proposals...yikes! Everything! Many times we'll use a Question and Answer format a la Ann Landers. You ask. I'll answer. Or I'll find someone else to answer. How's that? And be sure to include how you'd like to be credited (or not!). Yes, I'm also the Frugal Book Promoter and including your name, title, URL and maybe even a short blurb about your book certainly can't hurt your promotion campaign. (-: Just send your question to HoJoNews@aol.com. Be sure to put "THE FRUGAL EDITOR BLOG" in the subject line. With publishing? Your book proposal? Editing? I've published this way and that way--every way. With the right information, you can be in charge of your writing career. Contact me at HoJoNews@aol.com. Please put "EDITING" in the subject line.